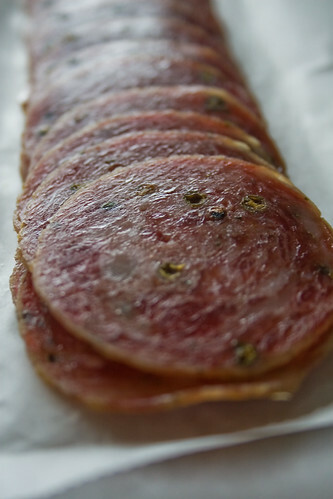 It’s been some time since I raved about the charcuterie available at Salumi Artisan Cured Meats in Pioneer Square. Not because I care about them any less than I did in the past. Mostly just because with their limited hours it’s a bit hard to get in to enjoy all they have to offer. Well, the good news is that as their popularity has continued to increase and their production facility has gotten larger, they are now able to supply a few places around town with some of their wonderful wares. 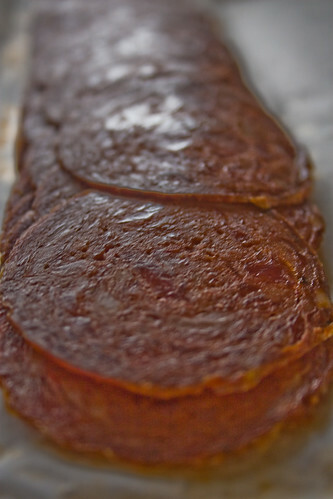 One of the places that regularly carries some of the Salumi line is DeLaurenti. The selection varies from day to day but they often have several varieties to choose from. So this means that Salumi salamis are available to me much more often – almost any time I want them. Last weekend while wandering the market I stopped by DeLaurenti and picked up a couple varieties: Winter, which as you may guess, is only available in the winter and is seasoned with lots of peppercorns and garlic; and Mole, a Salumi original seasoned with chocolate, cinnamon, ancho and chipotle peppers. The little bit of heat in both warms the blood on a chilly day. I definitively love your space… but, as I am not an english native speaker, it takes me several minutes to read each entry. I will come back soon, with my diccionary, cause I want to try your recipes. I\’m a culinary fool too, but I usually write my entries in french. Nevertheless, I\’ve translated my two last entries in english too. Could you, please, read them and tell me if you can understand what I wrote? jenj: I think you should make a little plan to come up to Seattle – maybe not for a few months though….. And, I\’d be honored if you linked to my space! Thanks very much! hi ika! I looked at your site and I can understand it really well. There are a couple of things we say differently than what you wrote but I could understand what you meant and that is all that is really important! ;-) That is very ambitious of you to write in two languages! Clothilde at Chocolate and Zucchini used to write in both English and French, but now I think mostly English.